has been established on the 10th of April, 1989. After 25 years working in the field of information business we can proudly say that we take leading position in the field of electronics, based on LED technologies, not only on the local market but also worldwide. We have succeeded in launching/promoting our company’s brand in more than 40 countries on all continents. As an evidence for the highest quality and effectiveness of our production is the fact that information systems are being placed in the Bulgarian Parliament and in the Council of Ministers of Republic of Bulgaria, airports, banks, stock markets, stadiums, sports halls and many other public places in Bulgaria and abroad. The products of MEGATEX company are produced to fit the maximum approach to the functional requirements of the customers, based on the fast and up-to-date solutions, wide range of capabilities and outstanding design. 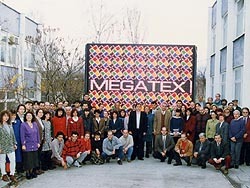 The highest quality of the products and services provides confidence and trust in the customers of MEGATEX. More than 25 years, our products are working without any problems and with a superb preciseness on a different geographic width, despite the sudden temperature changes and in the different meteorological conditions.